Despite the fact that he doesn’t appear in Robert Kirkman’s comics that serve as the source material for AMC’s hit zombie drama The Walking Dead, it didn’t take long for Daryl Dixon (Norman Reedus) to become a fan favorite on the series. Since the beginning, he’s been the best character on the show, often the lone bright spot when the show bogged down in the tedium of seasons two and three. Fans are also hugely protective of the younger Dixon brother, and as a result of those feelings, the latest still released from the upcoming season five is going to cause some trepidation. In past years a significant amount of time, at least a few months, usually passes for the between seasons for the characters of The Walking Dead. Due to the cliffhanger nature of the season four ending, that’s not going to be possible this time around. Without giving too much away, the season ends with most of the key people involved in a perilous predicament, one that will have to be dealt with sooner rather than later. This year there has been more security/less news from the Georgia set, though we’re willing to bet there will be substantial reveals at San Diego Comic-Con later this month. They are taking over the massive Hall H for a panel on Friday, July 25. Though we haven’t learned anything giant over the course of the off-season, AMC has been doing a decent job of doling out bits and pieces to make sure that they pique fan interest. We’ve seen pictures of group leader Rick Grimes (Andrew Lincoln) looking roughed up, heard news about new addition Seth Gilliam (The Wire), and even dealt with rumors of the possible death of one major character. 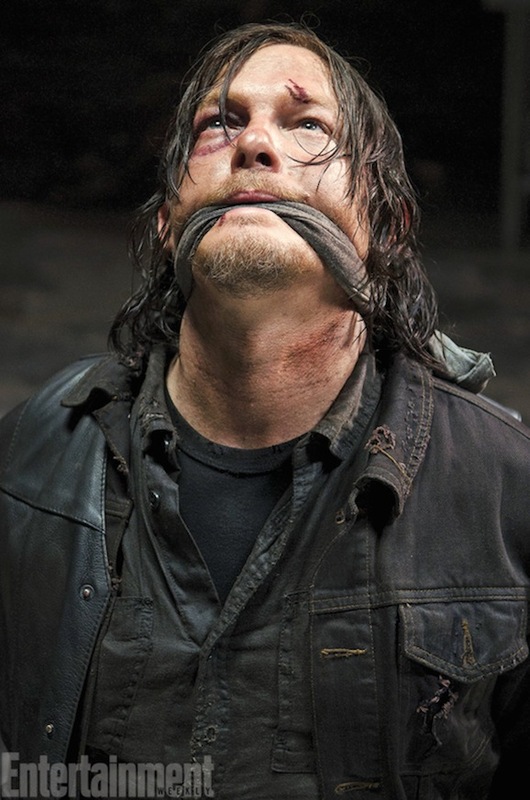 This latest picture, from EW, however, shows Daryl in obvious trouble, bound and gagged and looking like hell. Should we worry? The Walking Dead isn’t one to shy away from killing off important characters, and while I doubt they plan to off Daryl any time soon, it probably won’t hurt to be a little bit concerned. The photo is a little vague, we don’t know exactly what kind of trouble Daryl is, but it looks pretty serious. All we can do is speculate at this point, but if we had to guess, it has something to do with the cannibals who live at Terminus and have most of the group imprisoned in a boxcar like a bunch of hobos. Over the Independence Day weekend, AMC marathoned the entire series of The Walking Dead, which ended with a new clip and a sneak peek from season five. It doesn’t have anything to do with Rick, instead focusing on Carol (Melissa McBride), Tyreese (Chad L. Coleman), and baby Judith Grimes, but there are a crap ton of zombies. Tomorrow, Tuesday, July 15, the network will air another behind the scenes documentary, Inside the Walking Dead: Walker University, which offers a glimpse at how all of those extras make the transition from living human to undead flesh-eating monsters. 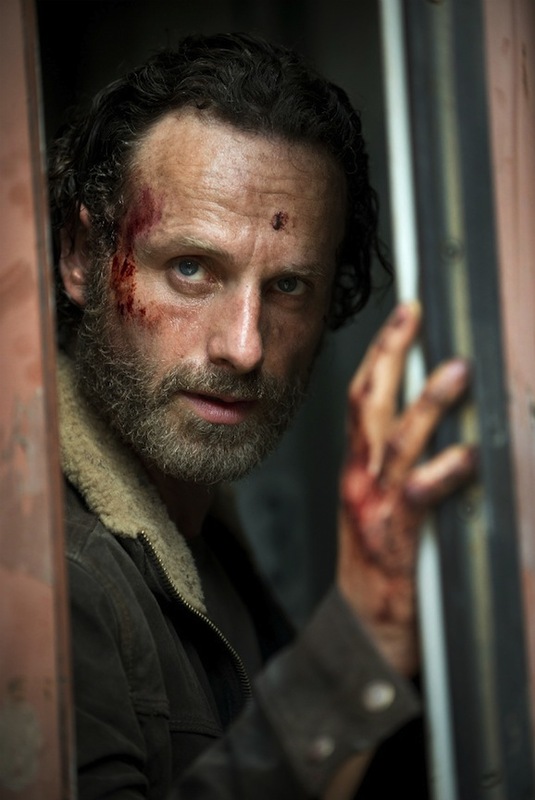 Season five of The Walking Dead returns to AMC this October.